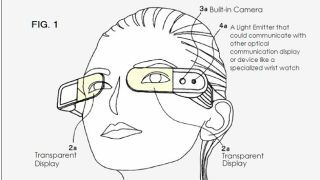 Sony is planning a rival to Google's Project Glass AR specs, which would allow pairs of users to share information by looking into each other's eyes. A recently-filed patent showcases tech that acts like the various 'bump' apps that allow folks to share contact details by placing their phones together. In this reality, instead of asking for a girl's phone number, you'd go up and stare into her AR bespectacled eyes until she hands over the digits. That's if the police don't show up first. Sony's Optical Communication Display Glasses, as they're coined, also possess "A Light Emitter that could communicate with other optical communication display(s), like a specialised wrist watch." The glasses could also communicate with a mobile phone, PDA or games machine, meaning they could be used for work or play. Aside from that feature, Sony's offering looks to be much like Google's. Naturally there's a camera on board, which would pick up QR codes and the like. There's also, like Google's Project Glass, a microphone and speakers built into the headset. We expect to hear more about Project Glass at Google's I/O conference next week, following several recent public appearances. Last weekend we reported on a purported Xbox 720 leak which proposed connected Kinect Glasses, so it seems the digital specs revolution is shaping up to be one of the biggest tech stories of 2013.